Hauptwerk Virtual Pipe Organ • View topic - Is it possible to improve the way to simulate dry samples ? As a church organist in a large church with an Ahlborn organ, I do not use the internal sound generator and I prefer to use the console and the audio amplifier existing system with Hauptwerk to get better sounds. However, many very interesting samples do not exist in a dry version. 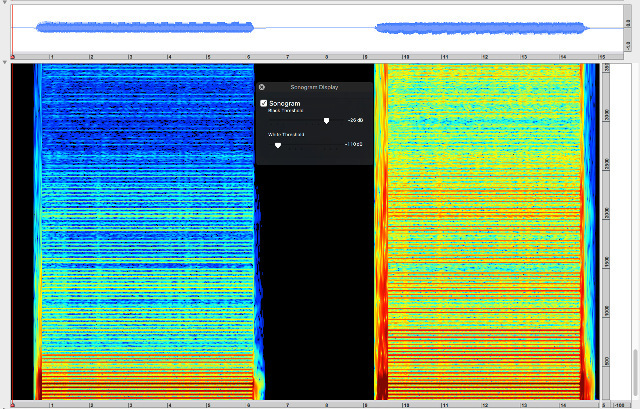 It has been advocated to truncate more or less the wet version, using the release truncation tool in the HW software. Some wet samples give worse results than others and I always have been desapointed by this operation, and finished to use an originaly dry sample. The main point is that in the truncated sample, the sound of each pipe remains dressed by its reverb. This is far more disturbing that the overall modification of the frequency spectrum. After each attack, we hear that the sound is growing. Truncating the reverb is not enough. As a consequence, I wonder if there is not a way to return close to the naked sound. Multiple released sample is a necessity to get realistic sounds (« harp-like » phenomena). Therefore it seems to me that it would be better if we could keep only the short notes samples. - when the multiple release samples is off, which release samples are kept ? - If the shortest notes are not automatically selected, is it possible to ask to Brett and to Martin to plan an enhancement, where the default mode concerns only the short notes ? It seems like HW wouldn't be able to dry out wet samples in a generic way, because the sustain samples contain reverb themselves. HW can truncate release samples because they are separate samples from the sustain tone, and don't even have to be played. But to decide which parts of a sustain tone's recorded fluctuations are really the building's return seems almost impossible. If samplesets were enhanced to use two samples for every sustain loop, one mic pair facing the pipe and shielded from the room, and the other facing the room, to play back simultaneously, then the second part could be not loaded as a rank to get a dry sound. I think. Perhaps I completly misunderstood the way the multiple release samples are built. In my understanding, short notes have also to be recorded to restitute correctly the staccatos in reverberating rooms. The time the key is down during the recording should be enough short in order that the echo effect is small. What I am saying to improve the simulation of dry samples from existing wet ones is to forget all the release samples in the wet sample except the ones which correspond to the shorter notes. Then, after a standard sample truncation, reverberation should be less present, an the dry simulation more realist. * it takes time to build up a tone inside an organ pipe. With staccato playing, both elements of the sound won't be fully developed. Only the latter is a matter of room acoustics, but I think the first is generally the most important. I am not entirely clear on what you are proposing but I think you may have misunderstood how HW works. I take your idea to be that looping a "short note sample" would simulate a dry acoustic, presuming that in this time the reverberation would not have built up significantly. Unfortunately for your idea there are no "short note samples" in the sample set: only the short-note release portion (after the key is released) is held. Even if there were, it is not a great idea since very short loops give rather poor fidelity. Choosing a short-note release rather than a normal release might make the acoustic sound a little dryer but will certainly not transform the set into a dry one. It has essentially the same problem as release truncation: the sustain portion will still be exactly the same and will still contain the intrinsic reverberation. You could use CODM to experiment by creating a custom organ with only short releases but I don't think you will find the results worth the effort. Thanks Adrianw for explaining me the flaws in my reasoning. I understand your arguments. I will certainly not spent time to create a custom organ with only short releases. Cavaillé-Cool wrote: Perhaps I completly misunderstood the way the multiple release samples are built. In my understanding, short notes have also to be recorded to restitute correctly the staccatos in reverberating rooms. The time the key is down during the recording should be enough short in order that the echo effect is small. What I am saying to improve the simulation of dry samples from existing wet ones is to forget all the release samples in the wet sample except the ones which correspond to the shorter notes. Then, after a standard sample truncation, reverberation should be less present, an the dry simulation more realist. The usage of the word "short" is a bit of a misnomer. There is more of an effect in terms of the attack and then the release (which is being ignored or truncated in this example). You definitely want all of the multiple samples in a sample set. You're not going to be playing every note staccato. Truncating samples just cuts down the reverb tails on the release samples. The reverb tails are what make a sample set seem "wet" (in conjunction with the mic position of course). Thanks Romanos for your comments. My initial idea was to use loops only inside the beginning of the recording. I had believed (wrongly) that the staccato notes were recorded on the same principle as the sustained notes. If this had been the case, we could have reduced the impact of the reverberation to get "pseudo dry" samples using the wet sample. Unfortunately, as Adrianw also indicates, the quality of the sound thus restored would be mediocre. What is the minimum sample length which should be used for loops to return acceptable sound in a church? It completely depends on the samples. As a general rule, you want as long of a [sustain] sample as you can get. Some companies to short/medium/long samples (again, this is independent of release samples). The longer the samples, the more realistic the sound tends to be as there is more natural variation that would be present in the real instrument. As it is, there might be a great sample set with 1 or 2 second samples but if you hold a key down that sample will loop 3 times in 6 seconds and there may be a poorly produced sample with 6 second samples and you'd still prefer the former. You really just need to experiment with dry or close-to-dry sample sets in your church to see what sounds best. I'd stay away from really wet sets or anything recorded at a long distance from the pipes (even with the reverb tails truncated) because you're trying to create an instrument in a room, not recreate a cathedral acoustic in your church. You don't want your organ to sound a mile away (even without reverb) when a "real" organ would be close right in the room. To reproduce a pipe organ, you need dry, long mono samples, which are then emitted via the left and right analog C-CIS tray. These should be broadcast separately for each work, It would be better if each register had individual channels. Unfortunately, dry samples are to be found only to a small extent, and the quality of the pipes over the entire key ranges is also not unbalanced and must be intoned..
Cavaillé-Cool wrote: As a church organist in a large church with an Ahlborn organ, I do not use the internal sound generator and I prefer to use the console and the audio amplifier existing system with Hauptwerk to get better sounds. However, many very interesting samples do not exist in a dry version. It has been advocated to truncate more or less the wet version, using the release truncation tool in the HW software. Some wet samples give worse results than others and I always have been desapointed by this operation, and finished to use an originaly dry sample. I can understand your dissatisfaction. Dry sampling is an exception to the main purpose of Hauptwerk. Dry sampling may require audio treatments that make setup work complicated. In my opinion the real problem is that generally you do not listen to the original dry sound but a dull variant due to the denoising process that is applied. Some small organs are more alive probably because there is no need to remove the noise from the sound: you can try "Adriatic Organ Model (Izola, 18th Century)" by SonusParadisi. It only has a keyboard but the sound quality is very present (compared to many others). If you want to hope to hear a good sound in church then it must be very present especially if the acoustics do not help you and there is a lot of distance from the source. Try comparing your listening with some ultra-detailed sound and you will understand what I mean (https://www.applied-acoustics.com/chromaphone-2/). More generally, not all dry instruments are musically interesting and not all dry samplings and processing are done well for various reasons. After the original note follows the same note processed. 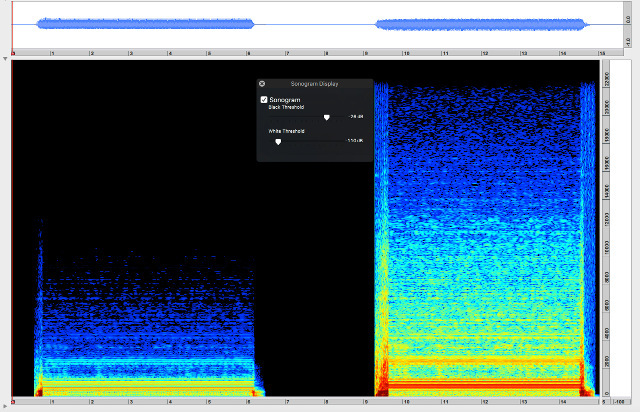 The following images represent the difference between the two notes as a spectrogram (up to 24000Hz the first and up to 3500Hz the second to observe the overtones). elia wrote: [More generally, not all dry instruments are musically interesting and not all dry samplings and processing are done well for various reasons. A big part of the problem is that Organs that sound interesting do so in great part because of contribution of the acoustic environment they are in. Furthermore, most organs of any quality are voiced, sometimes pipe by pipe, to suit that specific environment. Take the environment away and what you are left with may well sound strange and unmusical. I suppose, possibly, someone with enough time, skill and inclination could create a truly dry HW sampleset by synthesis rather than recording real pipes. In principle one could then use the HW voicing tools to match the organ to the acoustic it is intended for. I won't hold my breath though. The two sounds of Posaune that you heard above are very eloquent and represent the starting point of the discussion. It is much easier to explain with sounds than with words. With this I do not want to criticize the work of those who are doing dry sampling (they are very few!). They must think about the inexperienced user and keep the additive noise under control. The weak link is precisely the sound quality. A real organ pipe sounds better. Conceptually, the type of work to be done does not change, but we must start from a sound that is credible and alive, as if it were a real organ pipe. If we do not start from this fundamental point we can not think of making substantial improvements. Better little but more in focus.